Summer break is sadly coming to an end...parents on the other hand can't wait! Join us for Drunken Battle Friday this week! ARMA 3 @ 9:00PM EST - This week Omega is playing ARMA 3! Follow link below to the Omega raffle. .45 ACP EVENT @ 9:00PM EST - Shadow will be trying out the new game mode on August 2nd, get ready to through some large caliber lead downrange! Check out the link below for more info as well as to enter the Shadow Company raffle. Winner will receive 100 OTC! Have suggestions or ideas for a DBF event or contest? Reach out to myself or your divisional Special Events Coordinator. Join us for Drunken Battle Friday! FIGHTER BATTLE @ 9:00PM EST - This week India will be hosting a fighter battle in Space Engineers. You will have 20 minutes to build your fighter and the last person standing after the battle will be the winner! Follow the link below for the India raffle and to join in on the DBF event conversation. SQUAD @ 9:00PM EST - This week Omega is playing SQUAD! Follow link below to the Omega raffle. PUBG CUSTOM MATCH @ 9:00PM EST - How will you fare against other members? You will find out this Friday at the Shadow Co. DBF event! Check out the link below for more info as well as to enter the Shadow Company raffle. SIEGE: CASUAL MATCHES @ 9:00PM EST - Join Vanguard this Friday for some Siege! Follow link below for the Vanguard raffle or to join the conversation. Join us for Drunken Battle Friday this week! WARFRAME @ 9:00PM EST - This week India is jumping into Warframe to run some missions eidolons and most importantly - to have some fun! Warframe is free to play so download the game and get in on the action this Friday. Follow link below for more info and to enter the India raffle. RAFFLE @ 9:00PM EST - This week Omega is running a raffle this week, follow link below to get your number in! FORTNITE @ 9:00PM EST - It's Fortnite this week for Shadow! Check out the link below for more info as well as to enter the Shadow Company raffle. RANDOM NUMBER - Pick a number between 1 and 50, closest to the number wins with tie going to the lower number. Join us for Drunken Battle Friday - kick back with a cold one and gaming, you've earned it! STARBOUND @ 9:00PM EST - Join India for Starbound this week! There is a raffle too, follow link below for more info and the raffle. RAFFLE @ 9:00PM EST - This week Omega is running a raffle. Freshen up for next weeks event! PUBG WIN COUNT @ 9:00PM EST - Who can rack up the most confirmed wins this week? Be sure to screenshot those results and have fun this Friday! Check out the link below for more info as well as to enter the Shadow Company raffle. RANDOM DRAW - Favorite outdoor place you have visited! Could be a childhood camping spot, national treasure, lawn chair in your backyard. Join us for Drunken Battle Friday! With summer officially kicking off, celebrate with some gaming and entertainment that shape so many DBF moments! DAYZ @ 9:00PM EST - This week Omega is going back to their roots with some DAYZ! Hit some old stomping grounds, see what's new. Follow link below to follow the discussion or to enter the Omega raffle. SANHOK MAYHEM @ 9:00PM EST - This week in PUBg Shadow Company will have you in the thick of it on the Mini-Battle-Royale-Map! Check out the link below for more info as well as to enter the Shadow Company raffle. RANDOM DRAW - POST YOUR CURRENT GAME OF CHOICE! 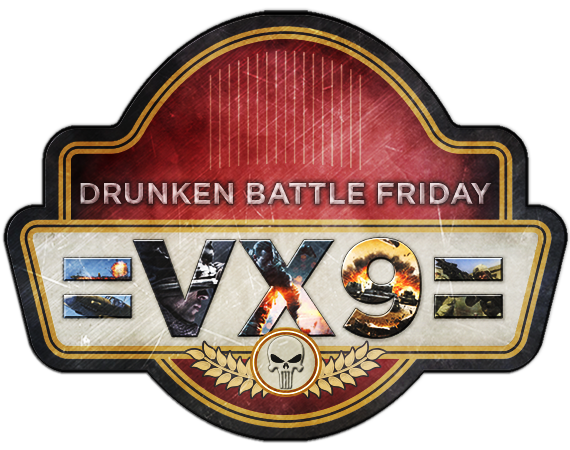 Join us for Drunken Battle Friday, we're kicking off summer (close enough) with Officers VS Enlisted! Be sure to have your beverages iced up and at the ready, you'll need 'em! OFFICERS VS ENLISTED @ 9:00PM EST - Join us in Fistful of Frags and take on your fellow =VX9=ers! Get that d/l started now so you are ready to roll! Smack talk is absolutely encouraged and some video clips to prove the pwnage is a major bonus. I bet we can even get Ripper to part with some swag if some great clips get posted here, so if you are recording - post up some awesome moments. Spread the word, it's on tomorrow! Join us for Drunken Battle Friday! OvE coming next week! ARMA 3 @ 9:00PM EST - This week Omega will be playing ARMA 3! Follow link below to follow the discussion or to enter the Omega raffle. FIRE BREAKER @ 9:00PM EST - This week in PUBg you will be lighting up the enemy with Molotov cocktails! Be sure to screen cap the fricassee (f12 in Steam) Check out the link below for more info as well as to enter the Shadow Company raffle. RANDOM DRAW - Drop a "ONE KILLING MACHINE! ", one person will be selected at random.